When you see a spider climbing up a sheer vertical surface like your bedroom wall, you're witnessing the work of hundreds of thousands of individual microscopic parts on the surface of his body. He may only have eight legs, but on those legs are many tiny hairs that help him grip and climb surfaces with no apparent footholds. The effectiveness of this adaptation depends on the spider's size, though -- particularly large spiders climb using an entirely different method. While small spiders don't look hairy to the naked eye, their feet are covered in tiny hairs. In fact, even their hair has hair -- the little hairs on their feet are covered in even smaller hairs called setules. A spider has more than half a million of these setules, all of which end in a triangular tip. These are flexible hairs, though, not pickaxes, so spiders don't actually dig into the wall as they climb. Rather, their setules trigger a scientific reaction that helps them adhere to a flat surface. A phenomenon known as the van der Waals force, produced by spiders' setules, gives them a sort of magnetic hold with the surface. Essentially, oppositely charged molecules within microscopically close proximity of each other create attraction. Think of the tips of a spider's setules as tiny magnets, that allow him to stick to a surface -- with just more than 600,000 of them all over his body, he enjoys a firm grip on the wall. The effectiveness of the spider's setules and the van der Waals force effect they create are conditional on two things: Their size and their volume. If you blew up a spider to 50 times his actual size, he wouldn't be able to climb walls the way he does now, because he would be too large and too heavy for the attraction to keep him adhered to the wall. The only reason it works at his natural size is because he is so small and so lightweight that the adhesion is more powerful than the force of gravity. While not all spiders can climb using their setules, that doesn't mean they can't climb at all. 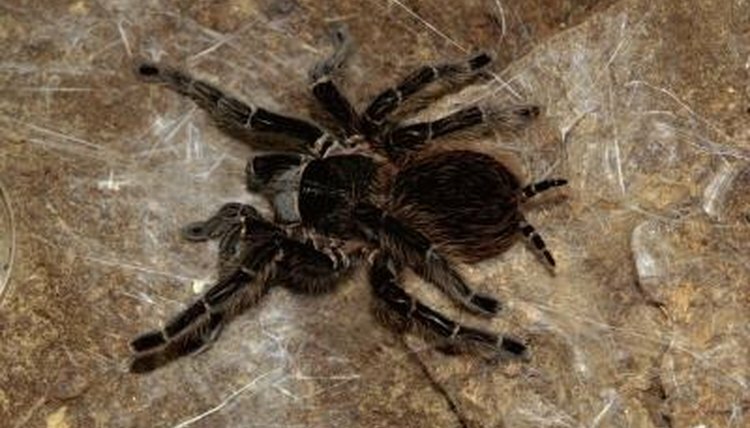 For example, the tarantula -- too big and heavy to climb using setules alone -- secretes a small amount of a silky adhesive substance from each of his eight feet. The adhesive acts like a temporary glue, and as he climbs, he leaves microscopic "footprints" of the solution in his wake. Scientific American: How Is It Possible for Insects and Spiders to Walk on Water or Walls? How Do Flies & Other Insects Walk Up Walls? Do Tarantulas Get Used to Their Owner's Scent?